Leading actress and Glo Ambassador Funke Akindele is currently the most sought-after bride in Nollywood. Since the story simultaneously hit newsstands nationwide and the internet, passionate reactions from hopeful single men have been pouring in via e-mails, SMS and phone calls from various parts of the country. From Benin City to Port Harcourt and even Abuja, the story has been the same. Lagos, the entertainment capital has not been left out as some hopeful lovers even went the extra mile of visiting the corporate headquarters of EE, located at Isolo. Due to space constraints, we have decided to serve readers with some of the 119 and still counting proposals from willing suitors and lovers. Thus says the most High God, “I have heard your earnest cry unto me and have given you a man outside of your tribe. He has no access to you but you will find him if you seek him. By the contents of his heart I chose him for you. To the Editor; kindly link me with Funke Akindele whose story appeared on your cover page last week. For I am sure that I am the right person for her. Dr David Tyokyaa. I work with Federal Government and I am based in Jos/ Abuja. I want to use this medium to respond to actress Funke Akindele. Since I have been watching her in home videos, I always think about her so much. One day, I heard that this star girl got married with star Yoruba actor, Femi Adebayo son of Oga Bello. However, when I saw that she needs a serious relationship, I was amazed because I like to be Funke Akindele's legitimate friend in the future. I would love to get married with her but I'm not sure if she will deem me fit to be her husband. Please Funke if you are reading “I don't know if you would like to get married to me because I don't see it happening. But if you are interested, I stay at Jakande Estate at Ailegun Road. You can also contact me on 07043131307. This message goes to Entertainment Express; please kindly send Funke Akindele's number to me. I saw her story on your cover page last Friday. My phone number is 08138628302. If she is interested in a serious relationship, I am available. Of course! It's her character behaviour and zeal that attracts me to her. It's not because of her money but because she is dedicated to her work. I see her all the time in the movies. I can marry her and when I get married to her, I will let her know all the bad aspect of her so that she will amend. I will stop her from putting on trousers and excessive paintings. I will tell her how to dress and behave which is very paramount. With her being submissive to me, I will do anything to marry her. For me, marrying Funke Akindele is not a big deal it all depends on her worth. My grandmother who just died of recent said 'Agwa bu mma', so I can marry her if she has a good character. If she can obey me as her husband and respect my family members. She may not be facially beautiful, but once she has a good character which I do not know now, I can marry her. Someone with her level of exposure will make a good wife because she has seen it all. If I have the opportunity to marry her, I will marry her. I like the way she acts; she is very natural. I will like to marry her if I get the chance to do so. Of course, she is intelligent and beautiful. Funke Akindele is the dream of every man. What she has got is what every man is looking for including beauty, intelligence and what have you. I love her, she is my idea of a wife. She being a star has nothing to do with love. Everything has to do with understanding. Once I can understand her and she can understand me. Actually I don't fancy female celebrities, but if anyone shows up and I see that it is God's will and she is God fearing, what stops me from marrying her. If she is God fearing I can do anything to marry her. I would love to marry her. She is a learned person, and exposed. She is talented and also a motivator. She is the kind of a woman that every man would want to get married to. So I can marry her if the opportunity presents itself. My names are Billy Dipo Shobo and I am 41 years old. I run a Non Governmental Organisation known (NGO) known as Interveteran Association. I am a very down to earth person. I am a Christian and I am single and I don't have any love child. I obtained a PhD four years ago. I have a first class in Journalism in Kenya and specialized in Forensic Correspondence. I had a Masters Degree in Social work. Funke Akindele is the type of person I want to marry; somebody who is career-driven and goal oriented. So after reading the cover story on Funke Akindele last week, I made up my mind to get in touch with the Editor thus my visit to your office. I must confess that I have always admired this lady for a long while now. In fact many of the things she said in the interview about her simplicity were things I have investigated and found to be true. I am thrilled by the way she interprets her roles in movies. I have watched her on TV since the days when she featured in the TV series entitled I Need To Know. I admire her roles in movies and with the little I have heard about her family background; I learnt her father is a respectable person and principal of a secondary school within my neighbourhood in Ikorodu. I am comfortable and I pay salaries of about 300 people. I don't ride a car and I don't make use of special or expensive phones. I have lived an anonymous life and I like it that way. I had a stint with British Council and they facilitated my education at foreign institutions. I have also worked with UNESCO. I live currently in Ikorodu. I am comfortable. I am the first in a family of six. I live in a four bedroom bungalow alone aside my house help and my mother who both come and go at intervals. I have had a relationship before now but it broke off several years ago and since then I have kept to myself. I wouldn't say that I am unlucky but it was painful then but I have moved on. We were supposed to get married and it was very serious to the point that we had an introduction ceremony. Compliments of the season to the entire management of Express Multimedia Limited. My name is Abolaji Ismaila. I am a native of Ifelodun Local Government of Kwara State. I finished my O'Level in 1986. Later I ventured into business. I took interest in your story on Funke Akindele in your paper last week. I am so interested in her and I would be very glad if my request would be sent to her. More grease to your elbow. Hi Funke, I once discussed you with one of your distributors. He told me all that you have said about yourself. Truly, your public perception makes me scared most times to approach you. Often times, it makes me feel inferior. More than ever, I am now convinced with this publication that your real life is different. I love you and your style. I am looking forward to taking you out. I believe that with God all things are possible. Tell him in your private moments and I'm sure he surely will answer you very soon. I will keep praying for you, because I want you to be happy and keep dishing out good performances for us, your fan. Cheer up. I'm interested in Funke provided she possesses the following: good looking and attractive, not with extra bag. I mean no attachment of any kind. No kid, no former husband and no divorcee; she must be very hardworking, highly educated with a degree in an area that can guarantee her continuous employment; must have moral values and be respectful; must be very single and in the age bracket of 18 - 28; and lastly, she must be financially independent. I don't believe in giving money or lavishing gifts on women. I still have more conditions that you have to fulfill all before I can give you any consideration. But I doubt if you can ever meet my minimum requirements. Funke watch it! Be wise, be careful and don't sell yourself cheap like most women are doing nowadays; or else you will regret it, BIG TIME! Our people say, when a person is crying, she can still see her way forward, even with the tears! So my sister, shine your eyes, well, well; in this matter of finding the right husband! If men are afraid or feel inferior to your success; then that is THEIR PROBLEM, not yours , Funke! Such men are not for WOMEN LIKE YOU! Avoid them! They should go find their own level by dating and marrying omo alata and omo oniparaga and non-achievers like themselves! Why should you apologize to any man for being a very successful and wealthy actress and film producer? Is that your fault or your glory? Akindele confesses: Pray for Me! 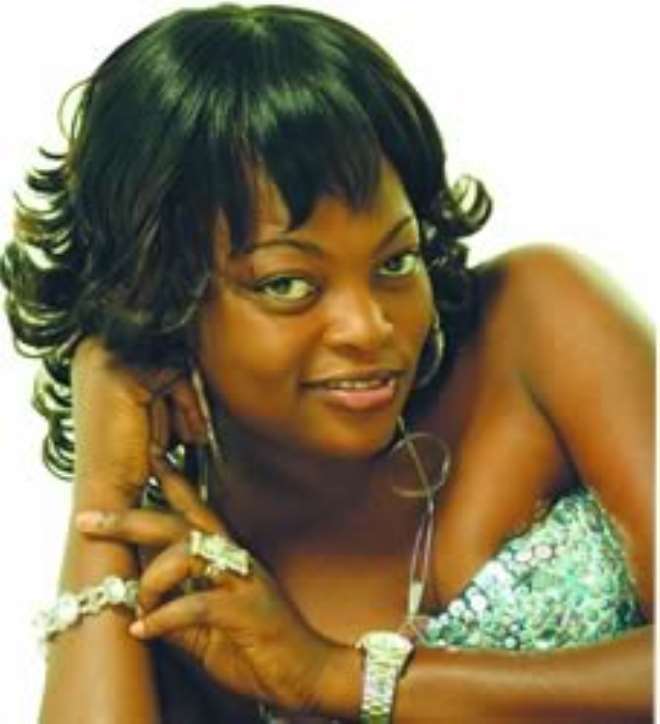 True to God, I need a man -Funke Akindele.